Named for the first steamboat to make its way up the Black River to the new settlement of Pocahontas in 1829, at 1100 square feet (102 square meters), The Laurel is our largest apartment. Located off the street in the back of the fully restored 1902 Lesmeister Building, this is also our quietest, most private apartment. There is one off-street parking space associated with the apartment. You can also use the free on-street parking or the large free city parking lot nearby at the intersection of Marr Street and Pyburn Street. Directions to the apartment are here. With its space split over three levels, you enter the apartment from your private deck, which is accessed by stairs leading up from your parking spot. From the deck you enter the apartment’s large living area. Across the living area there’s a short stairway down to the “main level” where you’ll find the kitchen, dining area, bathroom and utility room. Down another short stairway you’ll find the bedroom. For ambiance, we furnish a wood-burning stove in each living area. We’ll provide some wood. You provide the romantic spark! Free Wi-Fi, telephone, and a large flat screen cable television with DVD/Blu-ray player. This TV can also stream video services such as Netflix through the DVD player. A desk large enough to get some work done, if you must. Descending stairs 1/2 level down from the living area brings you to the main level of the apartment, with its original, ornate pressed metal ceilings 14 feet (4.3 meter) overhead. On this level you’ll find the thermostat control for the apartment’s central heating and air conditioning system. Utensils, wine glasses, silverware, plates, pots, pans. We even stock a few cookbooks in case you want to experience the joy of cooking in your free time. Gas cook top and oven. Small appliances including toaster, blender, and coffeemaker. A dining area with table for four people. A utility room with washer and dryer, iron and ironing board. Indulge in our body lotion menu, with three different European body lotions to sample. King sized bed with high threadcount sheets, both firm and soft pillows, comforters, luxury bathrobes for your use, and slippers. The famous Lesmeister Cistern. The cistern, an underground water reservoir, served as the building’s water supply in the years before Pocahontas had a regular city water system. The cistern is safely capped over with steel and concrete, but there’s a window (strong enough to walk on) and lighting so you can look down into the cistern and admire the craftsmanship of the men who built it over 100 years ago. A yoga mat, an exercise ball, and a foam roller cylinder. Since some people enjoy going to the sleep while listening to soothing sounds, the bedroom includes a “white noise machine” you can use if you wish, to produce the sound of rain or a waterfall or forest sounds. And, while Pocahontas is definitely a “sleepy little town”, if you want to sleep late some mornings, the white noise machine can easily cover up any undesired neighborhood sounds. 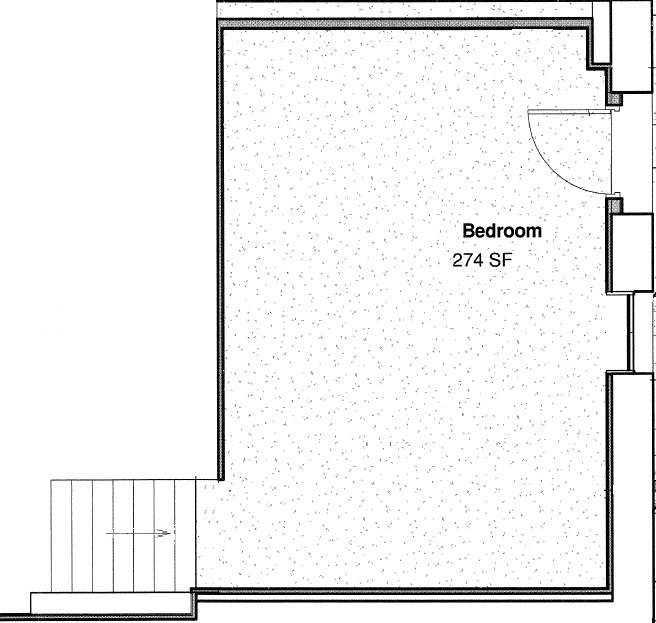 The bedroom has a window, and a door that opens at ground level under the apartment’s deck. All guests of The Lesmeister are welcome to use the charcoal grill in the rear of the building, on a first come, first served basis. RATES: Our rates vary based on the day of the week, and on availability. Select the Check Availability button below and enter your dates to see the exact rates for your dates. We offer a 20% discount for any stay of 7 consecutive nights or more, and a 40% discount for a stay of 31 consecutive nights or more. The Laurel was the first steamboat to make its way all the way up the Black River to Pocahontas, arriving here in 1829. The Laurel was known to be a well-made craft that required only two feet of water when fully loaded, making it well designed for traveling up to Pocahontas in the days before the “snag boats” worked the river to clear it of debris. It’s said that on the day in 1829 when The Laurel arrived here, it blew its steam whistle, causing Thomas Drew’s pigs to run wild all over town in fear (Drew later became the third governor of the State of Arkansas…he is buried in Pocahontas’ Masonic Cemetery). Some believe that a few of Drew’s best hogs escaped into the wild that day, after the blowing of The Laurel’s whistle, and became the famous Arkansas Razorbacks, the feral pigs that became the mascot of the University of Arkansas sports teams.